Miter gears are bevel gears put together with equal numbers of teeth and axes that are usually at right angles. Miter is the surface forming the beveled end or edge of a piece where a miter joint is made. Miter gears are cut with a generated tooth form that has a localized lengthwise tooth bearing. They are offered in various modules, number of teeth, speed ratio, materials and designs. Miter gears are made of steel, brass, bronze, aluminum, nylon and duracon. They are known for efficient power transfer and durability. They can carry heavy loads and can eliminate secondary operations that are useless during the process. They are used in drilling air holes in vacuum molds, drilling radial ports in door closers, milling oil grooves and act as a low cost spindle for dedicated machines. They are designed for the efficient transmission of power and motion between intersecting shafts at right angles. They can be of two types, ground spiral miter gear and spiral miter gear. They give smoother, quieter operation. They handle higher speeds and greater torque loads. They provide a steady ratio. 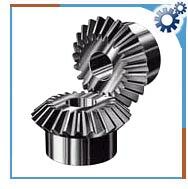 Miter gears are also used in printing, agriculture, bottling, and material handling and steering. They are used in various industrial sectors including-coal and mining, oil exploration, paper mining, chemical industry. They are used as important parts of conveyors, elevators and kilns.